I'm now finished in Ballymaloe about 8 weeks and it really does seem like a lifetime ago ... I've taken a bit of time to get around to writing this but ... better late than never, I guess! What did I get from this experience? Thinking about this actively creates a mental block ... it's difficult to formulate the words without getting all philosophical and deep and I don't think anyone is ready for that outpour! Overall I would say Yes ... the way Ballymaloe works is that all students regardless of previous cooking experience are cooking the same things at the same time, that means the course is structured as such ... the course may from the outside seem to have had an emphasis on Irish cooking you are really learning classic techniques that have stood the test of time! Don't get me wrong there were times during the course that I felt I was regressing in my cooking ability but in reality I wasn't ... it was just that I wanted to get back to choosing what I wanted to cook and not having to cook what I was told to cook or food I didn't find inspiring! The eureka moment where I realised what I had actually learned on the course was during my final cooking exam. Towards the end I stopped as I was plating up and it actually dawned on my how efficient I had been at preparing and how structured I had been in getting everything going at once (Yes I was over time but that's down to the menu I planned!!!). Since leaving Ballymaloe I have been cooking at home and abroad I can really notice the improvement, knife skills, confidence, ease of method in the kitchen etc. ... I also think I have a better feel and understanding for the food I am cooking! What did I get out of it personally ? Forgetting the food and cooking aspect, I think it is impossible to spend 12 weeks living a completely different lifestyle without at least noticing some little changes in yourself! I found myself being able to be a lot more comfortable around people and in new experiences ... I also managed to get more comfortable with speaking in front of large audiences as I forced myself to do a wine presentation and a final leaving speech (something I wouldn’t have dreamed about doing before) ... we'll see if that sticks. Since I've gotten back to the “real world” I seem to be a lot more relaxed and things don't get to me as much or wind me up as much ... even though it probably has a lot to do with not working and I am effectively in holiday mode .... but ... I am putting it down to Ballymaloe! The experience of Ballymaloe is like nothing that I can describe and do justice to ... it really is a special place, the people are warm, welcoming and generous with their knowledge and time (and i don't just mean in their work hours) ... within a day or two you feel like you have been there for years, and that is down to the atmosphere created by the teachers and staff! 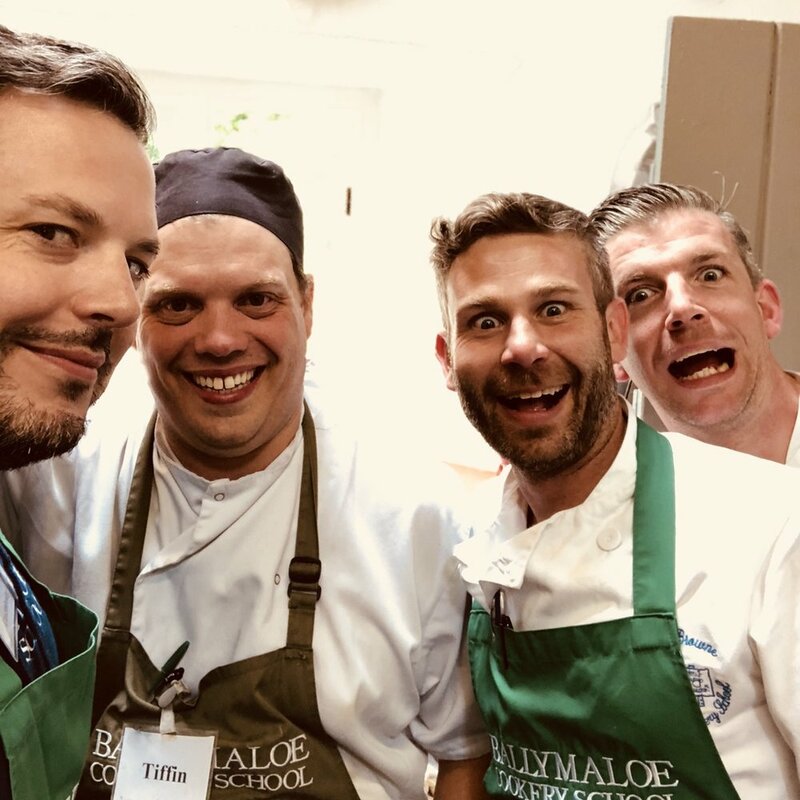 It’s also important to that Ballymaloe is not just about the cooking ... it’s about the whole experience that goes with it ... 3 months living in food heaven with like minded people, in one of the most picturesque places in Ireland and by the sea ... what more could you want! As some of you know I wanted to do this course twenty years ago ... now I have done it ... and I am so delighted that I kept that promise to myself and managed to do it! The experience of my life time!